Born in 1918 in Nashville, Tennessee, Tom Storrs got involved in banking early in his career and would eventually become one of the industry's national leaders, as well as an author on economics and banking. Junior Achievement Tom Storrs began his career with the Federal Reserve Bank of Richmond in 1934. He graduated from the University of Virginia in 1940 and later received a master's and doctorate in economics from Harvard University. He served on active duty as a Naval Officer from 1941 through 1945 and from 1951 through 1952, retiring as a Commander in the U.S. Naval Reserves. 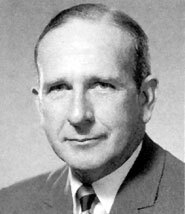 He joined the North Carolina National Bank as executive vice president in 1960. He became president of NCNB in 1969 and CEO in January 1973. He was named chairman and chief executive officer in January 1974, and served in those positions until his retirement in 1983. In 1971-1972, he served as chairman of the North Carolina Citizens for Business and Industry. Storrs also served as president of the Federal Advisory Council of the Federal Reserve System (1975-1976), and president of the Reserve City Bankers (1980-1981). Tom Storrs was active on many boards, including a director of the International Monetary Conference, chairman and member of the UNC Charlotte Board of Trustees, Davidson College trustees, Royal Group, Inc. and Black & Decker Manufacturing Company. Among his many awards, he has received the Distinguished Service Award from the University of North Carolina at Charlotte (UNCC). The Architecture Building at UNCC is named in his honor, as is a scholarship at the University of Virginia. In 1988, he was a co-author of The Bankers' Handbook.